If anyone has ever stumbled upon this blog, I apologize for never updating it. I had lost the piece of paper with my log on and the gmail I never use. Here are some pictures taken since my last blog in July. I've built quite alot of terrain and painted numerous models. Here's my work bench from August or September. 25 of the WWI brits are done, a bunch more are primed. I'll post pics of them hopefully soon. 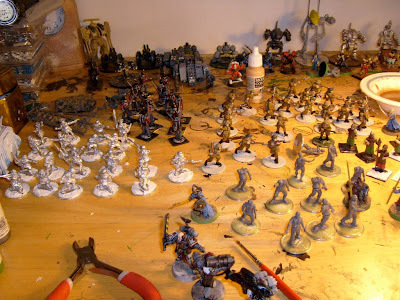 A few LOTR models, Perry British Plastics, W40K space marines, Pulp fiction, and Zombies, as well as some different Roman, ECW, and Hungarians all for Warhammer Ancients have been finished, since this picture. Here are some of the British Penisular War. I think I spelt that wrong. I meant Peninsular War, I think. 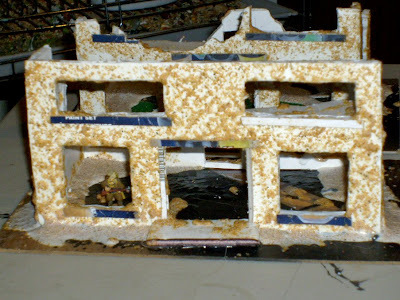 Here's the beginnings of some ruined buildings. They could be used for modern or sci-fi battles, or even WWII in a pinch. They're actually almost done and don't look so awful. I'll post more pics as well. They're made out of foam board, pinned together. Slathered in Elmer's glue and sprinkled with sand. Top view next to a silly fantasy hill with a skull on it. I finished the hill and it doesn't look so stupid anymore. I'll post a pic soon of that too. 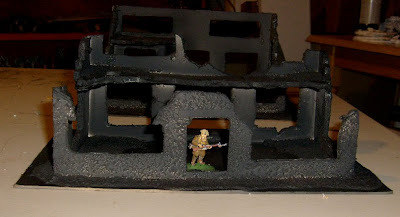 Here's a pic of the ruins, primed with black. I actually started to panic thinking they were going to come out like crap. They look good now though. I just can't figure out how to make sidewalks and I need to add some more rubbish. Thanks for visiting. 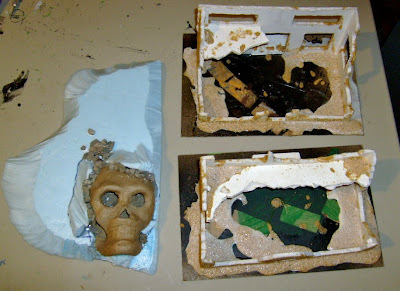 Next post I'll have some more terrain (buildings, trees, chain link fences), painted minis (Zombies, Brits, Ancients, and maybe even some space marines) , and a neat Aquarium building I found in a second hand store for three dollars.